The dream of a canal across the Isthmus of Suez had existed since the time 4,000 years ago when the pharaohs built Egypt's first canal. (It linked the Nile River with the Great Bitter Lake, which then opened onto the Gulf of Suez.) This canal, however, was filled in, and for centuries trade with the Far East was carried overland across Asia. Eventually ships began to sail around the southern tip of Africa to reach the Mediterranean Sea from the Red Sea. Then in 1858 a French engineer, Ferdinand de Lesseps, acquired the rights from his friend, Sa`id Pasha, viceroy of Egypt, to organize a company and build a canal. On Nov. 17, l869, the Suez Canal was opened with great ceremony at the northern terminus, Port Said, which was named for Sa`id Pasha. The 12,400-mile (19,950-kilometer) voyage from London around South Africa to Bombay, India, was shortened to 7,250 miles (11,670 kilometers). The Suez Canal is 101 miles (163 kilometers) long, or about twice the length of the Panama Canal. The Suez was easier to construct because it crosses flat, sea-level terrain and requires no locks. About 24 miles (39 kilometers) of the canal are channels dredged through lakes. Most of the banks of the other 77 miles (123 kilometers) are reinforced with stone, cement, or steel to help prevent erosion. The main channels of the canal are dredged to a depth of about 66 feet (20 meters), and the navigational width between buoys is set at 596 feet (180 meters). Double channels, where ships traveling in opposite directions can pass without stopping, have been constructed at four locations and cover a little more than 41 miles (67 kilometers). The largest ships allowed to pass through the canal may have a beam of up to 210 feet (64 meters) wide and a draught (below-water depth) of up to 53 feet (16 meters). Ships move through the canal under their own power, but large ships must be accompanied by a tugboat. The trip takes roughly 12 to 18 hours. To prevent accidents, vessels must travel in convoys at fixed speeds, fixed intervals, and fixed distances between passing ships. Convoys going in opposite directions are usually timed so they will pass each other in the Great Bitter Lake where there is a long double channel. Each day two convoys from south to north and one convoy from north to south sail through the canal, with a maximum total of 80 vessels a day. Yearly traffic numbers about 20,000 ships carrying between 300 million and 400 million net tons. Tankers and cargo ships account for nearly all canal traffic, but occasionally passenger liners and warships use the waterway. Northbound cargo is chiefly oil from the Persian Gulf headed for Western Europe. Southbound cargo consists mainly of manufactured goods and grain from Europe and North America destined for the Far East and southern Asia. By the Convention of Constantinople (1888), the canal was to be an international waterway open to all nations in times of war and peace. This convention has not always been observed. During both world wars Germany and its allies attacked but failed to capture the canal. In 1949, following the armistice between Egypt and Israel, Egypt denied the use of the canal to the Israelis and to all ships trading with Israel. In July l956 Egypt's President Gamal Abdel Nasser declared the canal to be Egyptian property and nationalized the Suez Company. 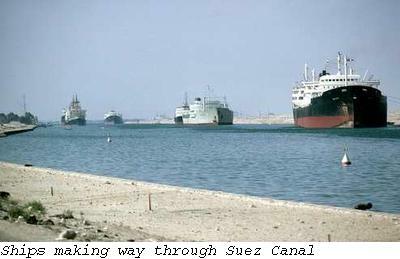 Since then the canal has been managed and operated by an autonomous government entity called the Suez Canal Authority. In 1963 Egypt paid the last compensation to Suez Company shareholders and became sole owner of the waterway. The canal was closed to shipping during the Suez Canal conflict (1956-57) and again in June 1967 during the Arab-Israeli War. The canal remained blocked by sunken ships and mines until June 1975. Egypt then reopened it and began modernization and reconstruction projects along major channels.